Email marketing remains one of most widely used strategies today, and for a good reason. On average, brands receive an ROI of 122% from email marketing. That’s 4x higher than other types of marketing strategies. But as with other marketing strategies, managing an email marketing campaign can quickly turn into a time sucker if you’re not careful. Part of this is because creating, implementing, and monitoring an email marketing campaign takes a lot of work. In fact, over 68% of brands using email marketing spend up to a whole week to create a single email. Give equal attention to different strategies. Brands use a combination of different marketing strategies to promote their products and services. Unless you have a team big enough to divide each of them to focus on one marketing strategy, you need to make sure that you and your team give equal attention to each of the strategies your business uses to get optimum results. 86% of business people prefer emails among other means of communication. However, spending a great deal of time replying to emails can quickly eat up your productivity at work. Let’s face it: each of your clients believe that their needs require your immediate attention and action all the time. Far too often, during these back-and-forth exchanges, you end up getting confused on which tasks and projects your client wants to be accomplished. Even worse, if you fall behind, the customer can feel that you’re not meeting their needs and take their business elsewhere. Also, spending too much time emailing one person means that you might neglect the others. If they feel you’re not proactively giving them updates, reports or answers, they’ll also feel that you’re not particularly concerned about their needs. 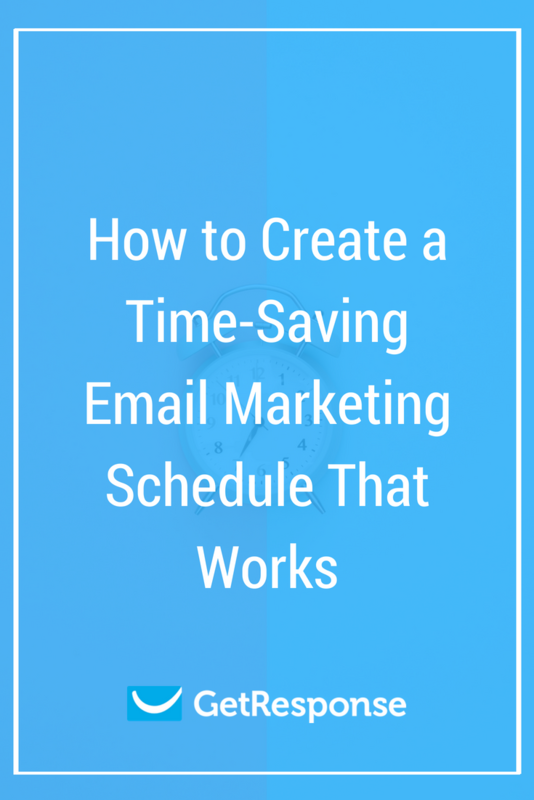 That being said, here are ten things you should do to create a time-saving email marketing schedule that delivers results. 1. Take control of your inbox. One study reports that an average employee spends about 6.3 hours a day on emails: 3.2 hours for work emails and 3.1 for personal emails. Email marketers spend even more, just because it’s part of their job. It consumes a significant amount of time during your workday, and your productivity also suffers. Believe it or not, your brain isn’t wired to handle multiple things at the same time. What happens when you try to multitask is that your brain has to stop what it’s currently doing, reboot, and then focus on the new task at hand. It takes up to 23 seconds to happen – quite an insignificant amount. But, this quickly adds up to minutes, and eventually, hours, wasted. To become more efficient, limit how often and how long you spend doing emails. 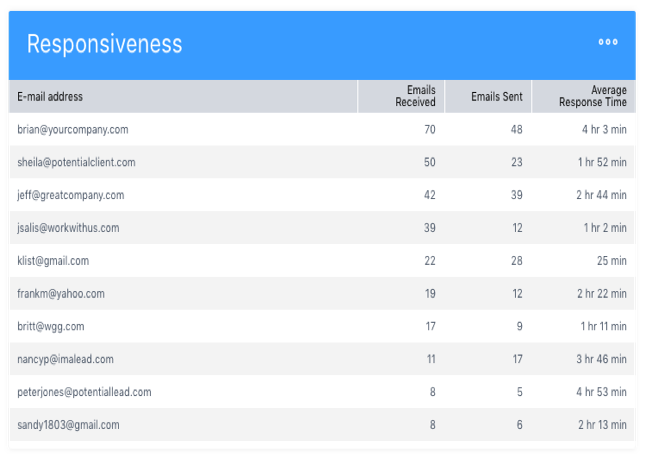 Using a tool like EmailAnalytics can also help you tame your inbox, especially if you’re using Gmail as your CRM. This software program gives you different detailed reports. This way you get a comprehensive picture of how long you’re spending on your email and, more importantly, where you’re spending your time. One of the things I like about this tool is its Top Senders / Recipients report. It gives you a list of addresses you’re getting the most emails from, and how long it takes them to respond. Instead of checking your email now and then, you can now use the received data to set your schedule when to check your inbox. EmailAnalytics also helps you monitor the email activity of your team members with its Average Time Spent per Email report. 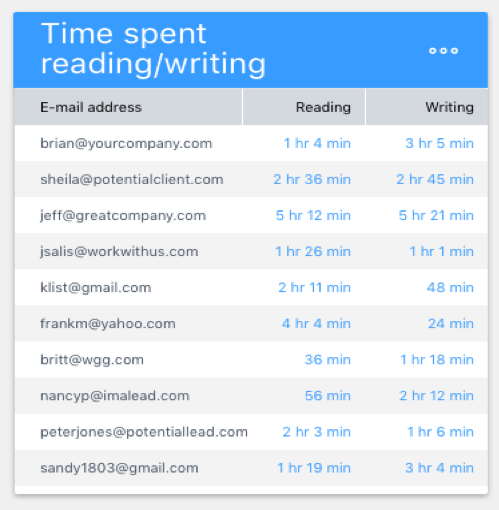 As you can see in the example above, it gives a breakdown of the average time that’s spent reading an email and the time spent writing a response. Ideally, you should only be spending up to five hours a week on emails to still have time to handle other marketing tasks. If you notice that you or any of your team members are spending longer than this on email, you’ll now need to take a closer look as to why this is happening. 2. Create an email marketing calendar. Having a visual calendar for your email marketing campaign allows you to keep track not only of when to send your emails but what content you include. It also ensures that your emails are received and opened by a greater portion of subscribers in your email list. This can be as easy as creating a Google Sheet that you can share with your team so that you’re all on the same page. 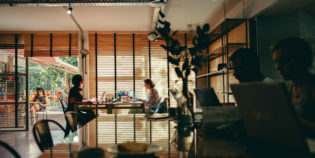 If your email marketing strategy is a bit more complex or you’re working with a remote team, project management tools like Asana or Trello are convenient. Email templates are an email marketer’s best friend. These are ready-made emails that you can tweak to make it fit your email marketing campaign. GetResponse has a wide variety of professionally-designed email templates you can use for your campaigns. A step-by-step guide on how to create emails using these templates is worth checking out. 4. Master the art of time blocking. Time blocking is a productivity technique where you block off a time range to complete a task. Hence, the name. During these time periods, you’re not going to do anything else except the specific task. I admit doing this can be difficult at first, especially since it’s so easy to get distracted when you’re online. But with a bit of practice, it will get easier. Once the time block ends, go to the next task. Don’t give yourself any extensions. That way, you’re training yourself to stay focused. I usually go a step further by incorporating the Pomodoro Technique in time blocking. Adding the Pomodoro Technique divides long time blocks into smaller chunks, allowing you to take a quick break in between. 5. Set up triggered emails. As its name suggests, a triggered email is a type of email that automatically gets sent to your subscriber based on their profile and where they are in your buyer’s journey. What makes it incredibly effective is that it makes your subscribers feel like you took the time to address their pressing concerns and needs. And you don’t have spent vast chunks of time responding to each one of their emails. More important, you can use these emails throughout your entire buyer’s journey. This increases your ability to nurture and guide your leads through your sales funnel even if you’re doing other tasks. Email marketers that take the time to segment their lists experience an increase in open rates, decrease in opt-out and unsubscribe rates, and growth in leads and email revenue. The reason is that your target market isn’t going through your buyer’s journey at the same pace. By segmenting your email list, you can create a more effective and personalized email content that satisfies their needs. One thing to remember is not to overdo it. Having too many segments would be counterintuitive. Instead of saving time on email marketing, you’ll end up spending more time making sure you give each segment the attention it deserves. This is a huge time-saver. Especially if you’re the only person in charge of doing email marketing. Delegating specific tasks to freelancers that have the skills and talent can free up your precious time and resources. You can find a lot of highly skilled, yet affordable, freelancers to handle your email’s content development, edit images, and create mobile-friendly layouts on sites like UpWork and Fiverr. 8. Keep your emails short but captivating. Your target audience is busy. So, you have a few seconds to get their attention to click your email and read its copy. Keeping the subject line and content short and straightforward will keep your reader’s attention enough for them to click on the link to visit your website. Short paragraphs will also make your emails mobile-friendly. Much of the time spent on a campaign is devoted to creating quality content. It’s challenging to come up with original content with share to your subscribers. Creating a curated newsletter featuring the latest trends and news within your niche is a smart way to save time while still providing value to your subscribers. All you and your team need to do is to write up short lines introducing the posts you’ll add to your email. BuzzSumo is a great tool to use for this. This software platform gives you a list of blog posts and articles performing well in shares in your targeted keyword. I decided to save this for last because it’s the most crucial. No matter how well you do the first nine, if you’re using an email platform that’s less than par, these won’t help you manage your email marketing schedule. Updating your email list manually is time-consuming. You need to make sure that the email provider you choose can seamlessly collect the details from your CRM and include these to your email list. That way, you can effectively manage both your CRM and emails at the same time. This is the age of mobile. Your email platform’s email templates should be designed so that it’s easy to read and click regardless of what device your readers use. 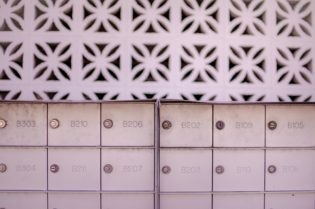 Your email platform should provide you with features that will help you manage efficiently as your email list continues to grow. Email marketing is effective in achieving your online marketing goals. While it’s much work to create, execute, and manage, it shouldn’t come to a point where you don’t have any more time for other tasks and responsibilities. On their own, each of these tips can free up the time you spend on email marketing. Combine them with focus and discipline, and it can increase your productivity beyond measure.